To cement the leadership of his North Carolina Shiftertown, Bowman O'Donnell agreed to a "mating of convenience." Two powerful wolf shifters, he and Kenzie keep the pack in order and are adored by all. 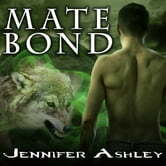 Bowman would do anything to protect Kenzie, for in each other's arms they've found far more than friendship. But as strong as their attachment is, they still haven't formed the elusive mate bond-the almost magical joining of true mates. Now with a monster ravaging the countryside and threatening the Shiftertown community, some in the pack fear that a pair without a true mate bond isn't strong enough to lead. Bowman and Kenzie will have to rely on their instinctive trust in one another to save their Shifters-and the ensuing battle will either destroy them or give them the chance to seize the love they've always craved.